I wonder if Fernando Ortega knew that his phrase, in the morning when I arise give me Jesus, would become the phrase that would impact and inspire so many Christians. It is our hearts desire to meet with Jesus first thing in the morning, yet many people don’t actually make it happen. It sounds nice and flowery, especially when you hear him sing the words. Maybe you don’t know how to make it happen. Maybe you don’t see the need to make your Bible study a priority in the morning. The Bible does not command us to spend time in the Word or prayer first thing in the morning. You will not find one verse that says, “thou shalt pray before the sun arises, every single day”. Because of this, no one should feel guilty if they aren’t making their quiet time a priority in the morning. God isn’t going to be angry or disappointed in you if you pray during your kids nap or quiet time. With that said, that does not mean that we shouldn’t be making spending time in the Word in the morning a priority. Why? Seems like a contradictory statement. Becuase in the Bible you will find many examples of great men who sought the Lord early in the morning. You’ll see that Jesus, David, Abraham, Moses, Jacob, Elkanah and Hannah, Hezekiah, and Job all rose up early in the morning to pray and worship the Lord. Therefore, we should be trying to pattern our own lives after their example. Anything that Jesus did is an example that we need to be striving to do in our own lives. Okay, so we say in the morning when I arise give me Jesus but then our day starts to spin out of control the moment that we get out bed and before we know if it is already time to put the kids into bed and fall into bed ourselves. Another day has gone by without you getting into the Bible or your prayer time. It sounds good in theory but putting it into practice takes us being intentional about it. I can not stress this enough, you need to get control over your morning hours if you want to have a successful day. Our mornings make the biggest impact on how our day plays out. If you wake up already behind you’ll feel like you’re never going to get ahead. 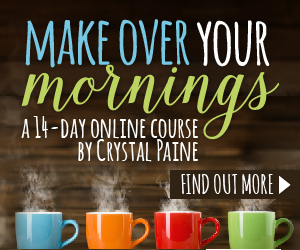 This course will teach you how to organize your mornings so that you can use your mornings wisely. Filling up your soul, getting some big priority items done first thing in the morning makes it so much easier to pour out and serve your family. It is true that you make time for the things that you love. If you’re finding that you can’t seem to find the time during the day to have your devotions then you need to make the time. If it is important to you then you will do what needs to be done. Start small, wake up 10-15 minutes earlier each day until it becomes easier. You will learn how much time you need. It will also depend on the season you are in. If you have a baby keeping you up half the night then simply waking up 10 minutes earlier may be all you can muster up. You will know what is right for you. I am not a good sleeper, so this option doesn’t really work for me. But because of Make Over Your Mornings course, I have learned how to use my mornings well even if the kids are awake running around like a bunch of goons. So if you’re not into setting that alarm any earlier, then try day 1 of the course for free to see if it is something you’re interested in! 3. Created a cozy place to have your quiet time. We all need incentives, right? Maybe you have a favorite space in your home that you can claim and set it up to be so warm and welcoming in the early hours that you will enjoy spending your time there. Have a comfy chair, a warm soft blanket, pretty flowers or decorations, a candle, your favorite coffee mug and your Bible study supplies handy. Then all you need to do is go from the warm bed to the warm chair. This is something that I am definitely trying to make happen for myself! Bring your cup of coffee and spend time in the Word in comfort. Doing the same thing for 21 days in a row makes it become a habit. I’m sure this is one habit we can all benefit from making. Once it becomes a habit that inner power struggle will stop. Promise. Knowing your why behind making your quiet time happen in the morning will help you become more disciplined in making it happen. On the days that it seems so difficult to get out of bed, reminding yourself of why you’re doing it will help you get out of bed. Why should we make spending time in the Word and prayer a priority in the morning? Because it sets the atmosphere of our day, we are giving our day over to the Lord for Him to direct, we are crucifying our flesh and choosing to walk in the Spirit. When we meet with Jesus first thing we have the strength to meet the day with a better attitude and we will be more apt to listen the Holy Spirit’s leading throughout the day. We all know that when we aren’t in the Word that our day tends to chaotic and messy, we have a harder keeping our attitude and tongue in check. This is a surefire way to set the tone of your day first thing. With these four ideas, you will be able to have Jesus when you arise. It doesn’t need to be flowery, wishful way of thinking. In the morning when I arise, give me Jesus. Your turn! Do you make spending time in the Word a priority in the morning? Do you believe that there is a difference in how your day plays out when you surrender it to the Lord first thing? What keeps you from having a morning quiet time? Let’s talk in the comments below! Since you are just starting out I would recommend a Proverb chapter in the morning, or a chapter from Psalms and then move into the book of John. They are all great places to start! Hope that helps! Yes, start the day this way. That is a great plan, I am doing the same thing actually as Love God Greatly is now on their little break before the next Bible study starts. I just started the book of Luke this week and I pair it with a Proverb 🙂 There is so much wisdom in Proverbs that I like to get a chapter in each day. I hope you’ll keep up with doing your Bible reading in the morning, I think that you will see a difference in how your days play out. Our morning time is so important in order to have a productive day! Glad I’m not alone! Thank you for your practical list of guiding us toward spending time with God. I have always done better when I intentionally carve out this time in the morning because as the day goes on, life gets in the way. Last week, I wrote a post titled “You are Known” and I unveiled my quiet time/writing space that my sons made for me. It is wonderful if you can to dedicate a specific space for your God time because you make it sacred for Him. Thank you again for your ideas. Blessings on the rest of your week. It definitely takes us being intentional about making it happen. Without it the mornings just slip away. Mornings can get away from me quickly. Thanks for the advice. It’s amazing how easily that time can slip away before we even realize it! I love these tips! I try to read my Bible and pray in the morning, it’s not always as long as I would like… but I am still happy to start my day that way. Waking up early and being in control of morning hours is SO key. I agree! It doesn’t matter how much or how little we can get in just as long as we are soaking some of the Word before our day gets away from us. So many fantastic tips in this post! I have been very disciplined in the past about meeting with God first thing (because He’s my first thing! ), but I’ve fallen out of that as of late. I always “have so much to do”, but I know that I need to reset my priorities. I took the Makeover your Mornings course and honestly, it was the most amazing thing ever! It created a pattern of discipline in my life…but I’m thinking I need to go through it again and refresh my priorities. That starts with putting God first! That course is revolutionary! I can not wait until she releases the Make Over Your Evenings Course! Being disciplined is definitely the key to making morning Bible reading a priority. Thanks for convicting me! I need to be better about this. Frankly–ironically–blogging is what seems to get in the way. Must fix. I start praying the minute my feet hit the floor, but I need to step up my a.m. Bible study. Yes, in the morning when I rise, give me Jesus. Stopping by from Faith ‘n’ Friends. When I started blogging I feel into the same trap. I used to wake up and doing my Bible reading first thing and then I started having to send out my email, do linky parties, and set up social media for the day and before I knew it it would be time for us to start school or run errands. I definitely needed to switch my priorities around. Glad I’m not alone in letting blogging take over your life trap, lol! Thank you for these great tips, Ana. I really need to get back to a routine that will become a habit. Now that it’s lighter earlier in the mornings, I won’t have much of an excuse for not getting up and out. I love going outdoors when I can. There’s something about nature that inspires me to look up and give thanks! Early sunrises definitely help to get you out of bed! I totally agree on that! I would add that having an accountablility partner is helpful — someone you text or e-mail every morning after you are done with your quiet time. Recently, I listened to Michael Hyatt’s podcast on “How to Become a Morning Person.” It’s totally free and very helpful. One suggestion he made that I have made good use of is turning on all the lights in the house when you get up — I do this first thing now, and it helps me quite a bit. Yes, accountability is big if you are trying to get a new habit formed. I have listened to that podcast episode by Michael and thought that he had some really good ideas as well. Turning the lights on really does help your body and mind to wake up-especially when it is so dark out in the dead of winter. I love that he wakes up with his wife. They sound so cute together! Oh, mornings are SO hard for me! But, I love your suggestion of a cozy spot! Great idea! Thank you for sharing at Faith Filled Parenting! We hope you’ll join us again Monday! Somedays I am better at this than others! Mornings are a tricky time for me, thanks for the great tips! Blessings to you. They can be tricky, especially with younger babies and toddlers. It gets easier the older they get! I’m a fan of Fernando Ortega and I love that song, too. I have made a cozy spot for spending time with God and I want to do it often during he day. Trouble is I get busy and oftentimes it gets left out and I find myself reading a passage and saying a quick prayer before I go to sleep at night. I like your suggestions. While first thing in the morning might not always work for me, I can make it a habit to do right after breakfast. You inspire me to keep working at it until it becomes a habit. I don’t know why I let other things get in the way, because I am always blessed when I spend time with God in His word and prayer. Blessings to you! I’m visiting from theTGI Saturdays Blog Hop. So glad you have a cozy spot! It is amazing how quickly the day can fly by when we haven’t spent time in the Word. You always tell yourself, I’ll do it at nap time, or after dinner, but something else always seems to get in the way. That is why I have to have a morning routine that incorporates my quiet time otherwise it wouldn’t get done. Great advice! This is something I have been working on also so I appreciate these ideas. I found you via Coffee and Conversation. I admit, I’m lazier than I’ve been in quite awhile. My husband and I both recognize this and must get back to reading the Bible together in the mornings again. Thank you for your tips. I’m glad you’re going to start making morning Bible reading a priority again! Good morning, I feel that God is directing me to start my own blog. I am trying to get all the information I can about other bloggers, especially Christian ones and how they go about doing their blog. Do you have any suggestions or helpful hints for getting started? Thank you for any and all help, have a blessed day! I’d look into joining Christian Bloggers Bootcamp by Arabah Joy and buy Blogging for Profit by Ruth Soukup. Crystal Paine also has a how to start blogging series on the top bar of her moneysavingmom.com site. Hope that helps. I like having quiet times in the morning otherwise I don’t always get time later in the day. I find that the days I have quiet time before the kids get up, I often find other times throughout the day to come before the Lord. Thanks for your encouraging words! Yes, his voice is amazing. You can usually find a playlist on YouTube of his songs, if you wanted to. I agree on the quiet time, it sets up our days looking for ways to add more of Jesus and centering our thoughts and actions on Him. Great advice! I can’t tell you how much more power, strength, and victory you will have in your day by spending time with the Lord every morning. Don’t give up. You can do it sisters!